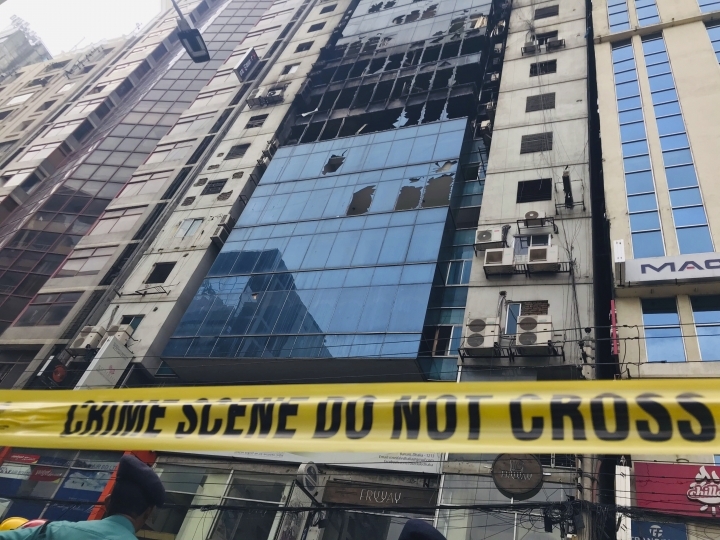 DHAKA, Bangladesh — Police in Bangladesh's capital have arrested two of the owners of a commercial complex that caught fire this past week, killing 26 people and injuring about 70, an official said Sunday. F.R. Tower's owners Tasvir-ul-Islam and S.M.H.I. Faruque were arrested in Dhaka and charged with negligence and violations of a building code that resulted in casualties, Additional Deputy Commissioner of the Detective Branch Shahjahan Shaju told The Associated Press. In cases where deaths occur as a result of negligence, defendants also usually face culpable homicide charges. The arrests were made late Saturday night and early Sunday. The blaze that burned for several hours Thursday trapped people inside the building, some shouting for help from windows on upper floors and the roof. Shaju said Islam, who is the chief executive of Quasem Drycells Ltd., was the owner of the top three floors and had no permission for the construction, while Faruque was the land owner of the complex. There are other partners who jointly own the building and police were looking for the chief of the construction company that built the complex. Islam, a district level leader, is tied to the main opposition Bangladesh Nationalist Party of former Prime Minister Khaleda Zia. Officials said earlier that the owners of the complex sought permission from the Capital Development Authority in 1996 to construct an 18-story complex but later raised it illegally. Fire officials said the complex did not have an adequate fire protection and detection system in place despite repeated warnings by them during previous inspections. Corruption and lack of monitoring often create scope for the builders and owners to slip through holes in Bangladesh, which is seeking to grow economically after maintaining more than 6 percent growth for the last decade. Bangladesh has fixed its main export-earning garment sector to a great extent in terms of safety and environment after a 2013 collapse of a complex housing five factories near Dhaka. Last month, a fire in the oldest part of Dhaka, a 400-year-old area cramped with apartments, shops and warehouses, left at least 67 people dead.